Founded in 1976, TIFF is now one of the largest and most prestigious events of its kind in the world. In 1998, Variety magazine acknowledged that TIFF "is second only to Cannes in terms of high-profile pics, stars, and market activity". In 2007, Time noted that TIFF had "grown from its place as the most influential fall film festival to the most influential film festival, period". This is partially the result of the festival's ability and reputation for generating "Oscar buzz". The festival's People's Choice Award—which is based on audience balloting—has emerged as an indicator of success during awards season, especially at the Academy Awards. Past recipients of this award include Oscar-winning films, such as Life Is Beautiful (1998), American Beauty (1999), Crouching Tiger, Hidden Dragon (2000), Slumdog Millionaire (2008), The King's Speech (2010), 12 Years a Slave (2013), The Imitation Game (2014), Room (2015), La La Land (2016), Three Billboards Outside Ebbing, Missouri (2017), and Green Book (2018). The Toronto International Film Festival was first launched as the Toronto Festival of Festivals, collecting the best films from other film festivals around the world and showing them to eager audiences in Toronto. Founded by Bill Marshall, Dusty Cohl, and Henk Van der Kolk, the inaugural event took place from October 18 through 24, 1976. That first year, 35,000 filmgoers watched 127 films from 30 countries presented in ten programmes. Piers Handling has been the festival's director and CEO since 1994, while Noah Cowan became co-director of TIFF in 2004. In late 2007, Cowan became the artistic director of TIFF Bell Lightbox, while longtime programmer Cameron Bailey succeeded as co-director. As of 2013, Bailey is now the artistic director of the Toronto International Film Festival, as well as TIFF Bell Lightbox's year round programming. TIFF was once centred on the Yorkville neighbourhood, but the Toronto Entertainment District later gained a greater level of prominence. TIFF is known for the celebrity buzz it brings to the area with international media setting up near its restaurants and stores for photos and interviews with the stars. In 2010, TIFF opened its permanent headquarters, TIFF Bell Lightbox, a year-round home for the appreciation of film in the heart of downtown Toronto. TIFF has grown, steadily adding initiatives throughout the years. TIFF Cinematheque (formerly Cinematheque Ontario) and the Film Reference Library (FRL) opened in 1990. The TIFF Kids International Film Festival (formerly Sprockets) launched in 1998. Film Circuit began exhibiting independent and Canadian films in under-serviced cities across Canada in 1994. Key dates  of the TIFF come in late August (Official Film Schedule release) and early September (tickets go on sale first to the Patron Circle Members, TIFF Members, TIFF Insiders, and only then to the public). The festival was founded in 1976 at the Windsor Arms Hotel by Bill Marshall, Henk Van der Kolk and Dusty Cohl. Beginning as a collection of the best-regarded films from film festivals around the world, it had an inaugural attendance of 35,000. Ironically, however, Hollywood studios withdrew their submissions from TIFF due to concerns that Toronto audiences would be too parochial for their products. In the years following, TIFF continued to concentrate on bringing the best films from around the world. Through consistent investment and promotion by its organisers and sponsors, the Toronto International Film Festival has also grown to become a vital component of Hollywood's marketing machine. In 1994, the decision was made to replace the name "Festival of Festivals" with "Toronto International Film Festival". 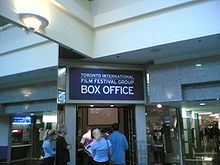 From 1994 to 2009, the umbrella organization running TIFF was named "Toronto International Film Festival Group" (TIFFG). In 2009, the umbrella organization TIFFG was renamed to TIFF. Short Cuts Canada, which includes 30-40 Canadian short films. In 2004, TIFF was featured as the site of murder mystery in the film Jiminy Glick in Lalawood, a comedy film starring Martin Short. In 2007, it was announced that the organization generates an estimated annual impact of $67 million CAD. By 2011, that benefit had grown to $170 million CAD. In 2008, Rose McGowan caused controversy at a TIFF press conference for her film Fifty Dead Men Walking, when she noted that "I imagine, had I grown up in Belfast, I would 100% have been in the IRA." In 2009, TIFF's decision to spotlight films from Tel Aviv created a controversy with protesters, saying it was part of an attempt to re-brand Israel in a positive light after the January 2009 Gaza War. In 2017, TIFF reduced the number of films screened compared to the 2016 festival with 255 feature-length films in 2017 vs about 400 films in 2016, and also eliminate two venues that had been used in prior years. Films such as American Beauty, Ray, Mr. Nobody, 127 Hours, Black Swan, The Five Obstructions, Singapore Sling, and I Am Love have premiered at TIFF. Jamie Foxx's portrayal of Ray Charles ultimately won him the Academy Award for Best Actor while Slumdog Millionaire went on to win eight Oscars at the 2009 Academy Awards. Precious, which won the 2009 TIFF People's Choice Award, went on to win two Oscars at the 82nd Academy Awards. The King's Speech, the winner of the 2010 TIFF People's Choice Award, won four Oscars at the 83rd Academy Awards, while Silver Linings Playbook, the winner of the 2012 TIFF People's Choice Award, went on to win the Academy Award for Best Actress for Jennifer Lawrence. Many Hollywood studios premiere their films in Toronto due to TIFF's easy-going non-competitive nature, relatively inexpensive costs (when compared to European festivals), eager film-fluent audiences and convenient timing. In 2007, the Festival Group began construction on TIFF Bell Lightbox, a new facility at the corner of King and John Streets in downtown Toronto, on land donated by Ivan Reitman and family. The $181 million facility is named for founding sponsor Bell Canada, with additional support from the Government of Ontario and Government of Canada. In 2010, the organization opened its new headquarters at TIFF Bell Lightbox. The facility, designed by local firm KPMB Architects, provides extensive year-round galleries, cinemas, archives and activities for cinephiles. The five-storey facility contains five cinemas, two gallery spaces, film archives and an extensive reference library, study spaces, film lab facility, and a research centre. There is also a gift shop, two restaurants, a lounge, a cafe, and a three-storey atrium. Cooperatively with Daniels Corporation, there is a 46-storey condominium atop, called the Festival Tower. The first film screening was Bruce McDonald's Trigger. The first exhibition was a retrospective on Tim Burton, organized by the Museum of Modern Art (New York). Subsequent exhibitions include Fellini: Spectacular Obsessions, Grace Kelly: From Movie Star to Princess, Designing 007: 50 Years of Bond Style, and Stanley Kubrick: The Exhibition, all of which were organized by TIFF, as well as one called Essential Cinema, featuring posters, images and props from TIFF's The Essential 100 list of films. The Film Reference Library (FRL) is a large Canadian film research collection. The library is a free resource for film lovers, filmmakers, students, scholars, and journalists, and is located on the fourth floor of the TIFF Bell Lightbox. An affiliate member of the International Federation of Film Archives (FIAF), the FRL promotes Canadian and global film scholarship by collecting, preserving, and providing access to a comprehensive collection of film prints, and film-related reference resources (including books, periodicals, scripts, research files, movies, press kits, and about 80 special collections. In 2016, the festival received a donation of 1,400 film prints, and launched a campaign to raise money for the preservation and storage of the films. Each year, TIFF also releases a Canada's Top Ten list of the films selected by festival programmers as the ten best Canadian feature and short films of the year, regardless of whether or not they were screened at TIFF. The films selected are announced in December each year. Previously, the winning films were screened at a smaller follow-up "Canada's Top Ten" festival at the Lightbox the following January, with a People's Choice Award then presented for that minifestival as well. In 2018, TIFF announced a change, under which instead of a dedicated festival, each Top Ten film will receive its own standalone theatrical run at the Lightbox throughout the year. Since 1984, every decade TIFF has also produced a Top 10 Canadian Films of All Time list. This list is produced from a wider poll of film industry professionals and academics throughout Canada, separately from the annual top-ten list. The festival's major prize, the People's Choice Award, is given to a feature-length film. It is not a juried prize, but is given to the film with the highest ratings as voted by the TIFF-going populace. It is presently referred to as the "Grolsch People's Choice Award"; past sponsors of the award have included Cadillac. The winners of this award have often later earned Academy Award nominations. People's Choice Awards are also presented for Documentary and Midnight Madness films. Each of the People's Choice Awards names first and second runners-up in addition to the winners. However, TIFF does present juried awards in some other categories. The festival presents three major awards for Canadian films: Best Canadian Film, Best Canadian First Feature Film, and Best Canadian Short Film, as well as international awards for Best Short Film, two FIPRESCI-sponsored Special Presentation and Discovery awards for international films, and a NETPAC-sponsored award for the best film from Asia having its world premiere at the festival. In 2015, the festival introduced Platform, a juried programme that champions director’s cinema from around the world; one film from the stream is selected as the winner of the Platform Prize. For all of the juried awards, honorable mentions may also be given, although the juries are expected to select one overall winner. The hundreds of films screened at the annual festival are divided into sections (referred to by TIFF as "Programmes") based on genre (e.g. documentary, children's films), format (e.g. short films, television episodes), the status of filmmaker (e.g. "masters", first-time directors), and so forth. Up until the early 2010s there were sections reserved for Canadian films, but beginning in 2015 all Canadian films are integrated in sections with films from outside Canada. Masters: feature films by "the world's most influential art-house filmmakers"
Platform: a competitive section launched in 2015, named for Jia Zhangke's film Platform, of films from around the world that do not have distribution in North America. Every year the Platform section has a high-profile international jury which confers a prize of C$25,000; both documentaries and narrative films are eligible for inclusion in the section; prior winners of the Platform Prize are the Canadian documentary HURT (2015), the biographical drama Jackie (2016) and Sweet Country (2017). In previous years, sections at TIFF have included Canada First!, City to City (2009 to 2016), Future Projections, Vanguard (up to 2016), and Visions (up to 2011). In 2016, TIFF hosted 1,800 members of the press and print media outlets such as the Toronto Star, The Globe and Mail, The New York Times, The Times of India, Los Angeles Times, The Philadelphia Inquirer, Miami Herald, and the Toronto Sun have published a significant amount of festival coverage. Also, the major industry trade magazines Variety, The Hollywood Reporter and Screen International all produce daily editions during TIFF. TIFF reports also appear in weekly news magazines; American, Canadian and international entertainment shows; news services; and a wide range of film and celebrity blogs. ^ "35th Anniversary Fact Sheet: TIFF Facts and Figures" (Press release). Toronto International Film Festival. September 27, 2010. Archived from the original on July 6, 2011. Retrieved September 21, 2010. ^ "2016 TORONTO INTERNATIONAL FILM FESTIVAL FACT SHEET" (PDF). Archived (PDF) from the original on October 24, 2016. ^ "Toronto 2013: Why the festival matters". BBC News. September 4, 2013. Archived from the original on September 5, 2013. Retrieved September 5, 2013. ^ Keegan, Rebecca Winters (August 2007). "Big-Screen Romance". TIME. Archived from the original on October 9, 2010. Retrieved May 28, 2010. ^ "Toronto Film Festival: Oscar Buzz Begins". CBS News. September 19, 2009. Archived from the original on November 4, 2012. Retrieved August 25, 2011. ^ "Everything you need to know about Joana Vicente, TIFF's new executive director". National Post, August 28, 2018. ^ "Cameron Bailey appointed Co-Head of TIFF". TIFF. April 19, 2018. Retrieved September 17, 2018. ^ Goffin, Peter (January 1, 2017). "TIFF co-founder Bill Marshall, 77, remembered as pioneer of Canadian film". Toronto Star. Archived from the original on January 2, 2017. Retrieved January 3, 2017. ^ "Cameron Bailey named artistic director of Toronto International Film Festival" Archived January 21, 2015, at Archive.today. National Post, March 14, 2012. ^ Mudhar, Raju (August 25, 2010). "From mega clubs to mega culture in Entertainment District". Toronto Star. Archived from the original on August 31, 2010. Retrieved September 7, 2010. ^ Allen, Kate (August 24, 2011). "TIFF's great migration". Toronto Star. Archived from the original on March 23, 2012. Retrieved August 25, 2011. ^ Stavrou, Philip (September 2005). "Film Festival events return to their roots". CTVglobemedia. Archived from the original on February 10, 2008. Retrieved September 19, 2014. ^ "35th Anniversary Fact Sheet: TIFF Facts and Figures" (Press release). Toronto International Film Festival. September 27, 2010. Archived from the original on August 4, 2010. Retrieved September 21, 2010. ^ Sterritt, David (April 2010). "Film Festivals - Then and Now". FIPRESCI. Archived from the original on September 6, 2013. Retrieved June 8, 2010. ^ "TIFF History". Toronto International Film Festival. Archived from the original on August 25, 2010. Retrieved September 21, 2010. ^ "McGuinty government helps promote Toronto International Film Festival". Ontario Ministry of Tourism, Culture and Sport (Press release). September 7, 2007. Archived from the original on January 17, 2013. Retrieved September 10, 2012. ^ "Festival Announces Boundary-Pushing Visions Titles" (Press release). Toronto International Film Festival. August 16, 2011. Archived from the original on September 12, 2011. Retrieved August 25, 2011. ^ The Globe and Mail (2008–2011). "Director apologises for Rose McGowan's IRA comments". Belfast Telegraph. Phillip Crawley, Publisher. ^ Israel set to launch in GTA, Canadian Jewish News, August 21, 2009. ^ Posner, Michael (February 11, 2010). "TIFF focus on Tel Aviv draws protests". The Globe and Mail. Toronto. Archived from the original on January 4, 2010. Retrieved August 17, 2012. ^ Klein, Naomi (October 31, 2009). "We don't feel like celebrating with Israel this year". The Globe and Mail. Toronto. Archived from the original on May 1, 2011. Retrieved August 17, 2012. ^ News, CBC (August 29, 2009). "Canadian director protests TIFF Tel Aviv spotlight". Canadian Broadcasting Corporation. Archived from the original on September 1, 2009. Retrieved September 16, 2012. ^ "A conversation with organizers of the Toronto film festival protest". World Socialist Web Site. International Committee of the Fourth International. Archived from the original on March 13, 2013. Retrieved April 16, 2013. ^ a b "TIFF Unveils 2017 Programmes & Programmers" (PDF) (Press release). Toronto International Film Festival. February 23, 2017. Archived (PDF) from the original on February 24, 2017. ^ Victoria Ahearn (February 23, 2017). "TIFF downscales for 2017". Toronto Star. The Canadian Press. Archived from the original on February 24, 2017. Retrieved February 23, 2017. ^ Ebert, Roger (September 2008). "Starting off the season". Chicago Sun-Times. Archived from the original on June 22, 2012. Retrieved June 8, 2010. ^ "TIFF unspools with celebrities eager to connect with fans". The Canadian Press. CTV. September 2009. Retrieved June 8, 2010. ^ Rich, Joshua (January 2005). "Fest intentions". Entertainment Weekly. Archived from the original on June 6, 2011. Retrieved June 8, 2010. ^ Norman Wilner (September 9–16, 2010). "Let there be lightbox". NOW. Archived from the original on January 17, 2013. Retrieved August 17, 2012. ^ Germain, David (September 9, 2010). "No place like home: Toronto film fest opens new HQ". U-T San Diego News. The San Diego Union-Tribune, LLC. Archived from the original on January 17, 2013. Retrieved September 16, 2012. ^ "A look at the Stanley Kubrick Exhibition TIFF 2014". The Vancouver Sun. Canoe Sun Media. November 27, 2014. Retrieved August 3, 2015. ^ "TIFF gains cach of 1,400 film prints" Archived November 17, 2016, at the Wayback Machine. Toronto Star, November 16, 2016. Page E2. ^ a b "TIFF reveals Canada’s Top Ten Film Festival line-up" Archived December 22, 2015, at the Wayback Machine. The Globe and Mail, December 8, 2015. ^ Walmsley, Katie (September 2009). "Oprah flick 'Precious' wins top award at Toronto". CNN. Archived from the original on May 26, 2012. Retrieved June 8, 2010. ^ "You Pick the Winner: How to Vote for the Grolsch People's Choice Award". TIFF. 2016. Archived from the original on August 25, 2017. Retrieved August 25, 2017. ^ Chris Knight (September 18, 2011). "Lebanese film wins TIFF People's Choice Award". National Post. ^ "‘The Imitation Game’ wins top prize at TIFF" Archived November 17, 2016, at the Wayback Machine. The Globe and Mail, September 14, 2014. ^ Knegt, Peter (September 2009). "'Precious' tops Toronto winners". IndieWire. Archived from the original on August 29, 2010. Retrieved June 8, 2010. ^ Graham Winfrey (February 7, 2017). "TIFF Programmer Colin Geddes Departing After 20 Years". IndieWire. Archived from the original on February 25, 2017. ^ Anne Thompson (July 15, 2015). "Why the Toronto Film Festival is Adding 'Platform' Competition Sidebar". IndieWire. Archived from the original on February 24, 2017. ^ Etan Vlessing (August 11, 2016). "Toronto: Natalie Portman's 'Jackie' Biopic, 'Moonlight' From Brad Pitt's Plan B Join Lineup". The Hollywood Reporter. Archived from the original on August 11, 2016. ^ Dargis, Manohla (September 18, 2015). "Toronto Film Festival: Separating Contenders From Pretenders". The New York Times. Archived from the original on December 13, 2017. Retrieved May 15, 2017. ^ Kirkland, Bruce (September 18, 2015). "TIFF 2015: The most fascinating films that closed the festival". Toronto Sun. Retrieved May 15, 2017. Wikimedia Commons has media related to Toronto International Film Festival.